ACANTHUS ARCHITECTS df submitted the Kings College Crown project for the Aberdeen Society of Architects Design Awards 2010 and won! 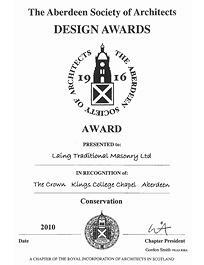 Kings College Crown was recognised in the Conservation category. The Aberdeen Society of Architects was established in 1898 and represents some 200 Chartered Architects within the City of Aberdeen, across Aberdeenshire and also Morayshire. The ASA's main objective is to promote the interests of architects and architecture within its area. This is partly achieved through the ASA Design Awards which is designed to acknowledge and publicise excellence in architecture.